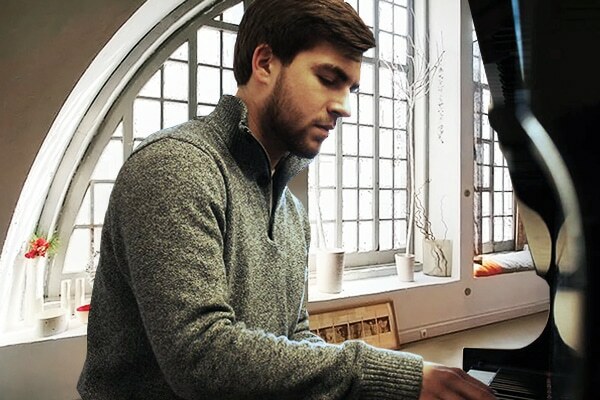 Ryan Fine is a young musician studying Commercial Music Production at the University of Cincinnati College-Conservatory of Music. Keep up with him on his Facebook page & personal website. AMBITIONS: Hopefully, I will have an opportunity to work with major artists in the music industry as a producer. Helping musicians and the general flow of mainstream music is an ambition of mine. As far as location goes, I want to be in Nashville with all of the amazing talent! TURN–OFFS: I dislike it when songs and artists get too predictable. I’m always shooting for a new sound and treating each song as its own. TURN–ONS: Song structure is my favorite aspect of music. I appreciate it when artists can make consecutive phrases or song sections memorable, while contributing to the story’s purpose. DREAM GIG: My dream gig would be opening for Billy Joel at Madison Square Garden. And to finish the performance, sing “She’s Got A Way” with him. CRAZIEST PERSON I KNOW: My sister, Kelly, is crazy great. She is my best friend and an important, positive influence on my life. She is a go-getter and incredible musician. MY FAVORITE CONCERT EXPERIENCE: Paul McCartney’s show at Cincinnati’s Great American Ball Park. While everyone was standing up and cheering, I was sitting in awe taking it all in. He was all I listened to growing up, so seeing him in person was an out-of-body experience. Eventually, I got up and shouted all of his songs with the crowd. I WROTE THIS SONG: “Subway Train” is a short and sweet piece. I wrote it thinking about motivation. Sometimes I like to take a step back from my busy life and go through the motions to keep a wider perspective. I related this sensation to lying on a subway train. I imagine someone stopping their schedule to relax, but still move somewhere with the train. It may be a stretch of an analogy, but regardless the song is relaxing and catchy.